The first of our houseguests arrived Sunday night; a family of four that make me thankful for the blessing of good friends. More houseguests arrive tonight and then more on Wednesday; the kind that make me thankful for family who are willing to fly and fight traffic to celebrate the upcoming holiday in my home. We are bursting at the seams with love, good cheer and children who can't get enough of each other. There's already so much that makes me thankful. On top of that, I get to play cookie crafting with three little girls and one little boy while we make our favorite edible Thanksgiving turkey placeholders. Maybe, just maybe, if I get really lucky, the children will be convinced to put on a classic skit about the first Thanksgiving with Pilgrims meeting the Indians capped, of course, by a grand finale rendition of Albuquerque He's My Turkey. I've copied the lyrics below...in case any of you aren't familiar with this Thanksgiving gem. It's sung to the tune of Darling Clementine; and if it's reproduced over your Thanksgiving table, that will be one more thing that makes me smile. And he's feathered and he's fine. And I'm awfully glad of that. We had scrambled eggs instead. Labels: Family. Friends. Joy. Craziness. Thanksgiving. The intersection between it all. Writing. Life. What about that left turn we should've made at Albuquerque? Have a great Thanksgiving, Johanna! I can just hear children singing that song. How delightful. As good as the eatables. Enjoy your guests, and Happy Thanksgiving to you and your family. Oh thank you so much for that. Now it will take forever to get it out of my mind, lol! I'm so glad you'll have a houseful of guests for your first Thanksgiving in your new home. It will make it so much more like home. Love the cookie/cake/candy turkeys. What a fun idea to do with kids! Happy Thanksgiving Johanna! Have a wonderful time with your family. 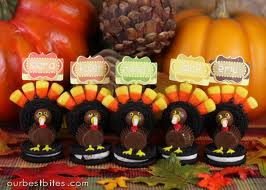 I saw those little turkeys on the Food Network, how cute! I haven't heard this song before. How cute!! Have a wonderful holiday, Johanna! Those turkey cookies look so good! And Happy Thanksgiving to you too! I don't really celebrate Thanksgiving anymore; when I worked in retail, they wouldn't let us take any time off during the holiday season. The habit kind of stayed with me. But it's nice to see that other people are keeping up the tradition! Happy Thanksgiving! And you won Gravity by Cherie Reich. Please e-mail me at natalieiaguirre7@gmail.com so I can arrange for you to get your book. Hope your Thanksgiving was grand! It certainly does sound like things were bursting. Cuuuute turkeys.